Vote for the council you want. There are elections for Swanage Town Council and for Purbeck District Council in the north ward of Swanage — to replace the former Tory Mayor who resigned suddenly. And there's an election for Purbeck District Council in the south ward — owing to the natural end of the present councillor's term of office. (There'll be another by-election in June to replace the disqualified Conservative, Mrs Wheeldon). Something to look forward to in June! If you ever have a view about anything, vote to get the council you deserve. We now have an appeal date: Tuesday 11th July at 10am Westport House Wareham. A design statement will follow shortly. Your comments and/or suggestions would be most appreciated. Years ago we had just a few Doctors here. Yet we managed quite well. Now we have a large Health Centre with very many more facilities than ever before. But has health care improved? I am not so sure that it has. For despite the new facilities now on offer the availability of a Doctor has become a great deal worse. If we fall ill at night, and need help at home, we have to get a duty Doctor from outside of the area to turn out. That in itself, is difficult, with the traffic associated with a seaside area. It seems to me that anyone suffering a heart attack would have little chance of survival, if aid had to drive here from Ferndown or Ringwood. That prompts these questions…Do our Doctors turn out at night at all now? Why is it, with ten Doctors, and enough support staff to cope with a major incident, has it become so difficult to see a Doctor? And, sometimes having to wait a week or more to see one? Better now? Perhaps a Doctor would give his views on this subject? I am compiling information for an Access Guide to help disabled people in Swanage, whether resident or visitors. This will initially cover the town centre and the routes in and out, businesses that offer disabled access or assistance, and those that visit or deliver. There will also be a map showing drop crossing points and how to get around in a wheelchair or on a travel scooter that can’t climb kerbs. Not only is Sandbanks the most expensive place for property, (front of the Echo on Thursday 13th April with a house at £11.5 million), the Sandbanks Ferry must be the most expensive transportation in the World, shortly to be £0.90 for a pedestrian and £3 for a car. The distance travelled is circa 1,060 feet, (depending on the tide), or a fifth of a statute mile making it the equivalent of £4.50 and £15 a mile respectively, or say £45 to Wareham on the bus ! The ferry carries about 48 cars equal to £720 a mile. Could be that the Essex owner of the company is buying the house at £11.5 million, they could afford to. There is a Public Inquiry at the Knoll House on 26th April at 10am to ask if the increase is justified ! A tunnel would be cheaper, or even Concord. The license was granted by act of Parliament which could be repealed by petition. Now there’s a thought. Have a happy Easter Swanage folk. It is rather too early for Grockle hunting...They are not fully fledged. let them at least strengthen their wings. I see the so called Welfare Housing Trust is at it again. There is a report in the Echo saying they are threatening to build some sort of concentration camp for asylum seekers on the Grammar School site if they don't get the OK for their holiday village plans. The Home Office has pointed out that this is nonsense and that they have no intention of doing anything of the sort here. What this company is doing amounts to trying to stir up racial hatred to put pressure on the District Council. Isn't this against the law? Thanks to all those who turned out last Friday to the Pier Trust Public Meeting. The main topic of the evening became the plans for new buildings on the Pier. 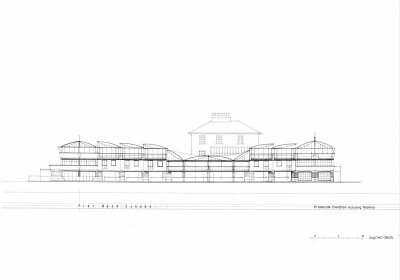 Last year new buildings were planned and grants in the pipeline to commence the building, but the Trust held back their planning applications until the new owners of Divers Down acquired planning permission for their new Diving Academy. They had their plans turned down twice last year by PDC, despite the Town Council and The Pier Trust approving these. Comments from the planning officers at PDC were. "The proposed building has an inappropriate domestic form and confused architectural references". Divers Down, The Trust, The Architects, Divers and other groups consider a new building should be a bright, modern, functional design, depicting some of the Pier feaures. This is exactly what the Architects presented and had rejected. Members of The Pier Trust receive many complaints about the existing portacabins etc on the Pier, so the Trust invited the PDC planners to a meeting with the owners of Divers Down and the Trust to try to solve the type of design PDC would consider. Unfortunately PDC did not take up the invitation so the Trust decided to convene the Public meeting to explain the situation. Divers Down will shortly be submitting yet more plans to PDC and we ask all of you to view these and make your comments to PDC. I will place a posting on this site just as soon as we have dates. (a) That Swanage is one of the top dive sites in the UK. (b) During the 48 years that Divers Down have been operating on the Pier, Divers and their families have spent millions of pounds in this town. (c) More and more Divers are now going on foreign holidays to exotic locations. (d) Weymouth are trying to encourage more Divers there by possibly sinking an old warship, like at Plymouth. (e) Upkeep of the Pier relies heavily on Diver's income. The modern Diver looks to having the best services and equipment. Divers Down intend offering all of this, but without a suitable building , Divers will lose the attraction of coming to Swanage. If numbers deteriorate, this will directly effect the income of Divers Down, The Pier Trust, Guest Houses and Hotels. Camping & Caravan Sites, Pubs, Restaurants and a host of other businesses in our Town. Please watch this space and support Divers Down and the Pier Trust with their planning applications. I think it would be nice to be able to talk about the history of Swanage, (Recent and older)and the people here. For the local folk have had a lot of fun amongst theirselves. There are I know, lots of interesting people here. With some interesting tales to tell. I feel that we need a place to remind us, and to recall some of the characters that walked our streets and slipped away. For 60 years, ever since the beach was cleared of debris after the war I have taken great pleasure in being able to walk along the beach. When my children were small we were disconcerted to discover that the new groynes to the north of Ocean Bay were a barrier over which we had to scramble if we were agile enough. Last year there was such delight when those groynes were breached to enable a survey and we surged through and made it to the foot of the chalk cliffs. We couldn’t believe it when those gaps were plugged. THEN IMAGINE OUR JOY THIS WINTER! The fascination of watching the surge of sand upon the beach and the pas des deux of the bulldozers. The piles being driven into the sand. We watched with baited breath to see what kind of groynes we were going to have. Then joy of joys we realised that they were not going to tower over us, nor divide the beach like some Berlin wall. We could skip and jump along the water, unimpeded. We could sally forth towards the cliffs without obstruction. Imagine my despair this month as those groynes have been girdled and braced. The effort required to cross these monstrous hurdles is quite beyond me. The simple pleasure of a walk along the beach has disappeared forever for the vast majority of Swanage residents who are too old or too young. Is this latest addition to the groynes really necessary?